It is an unseasonable cold May night in Seattle, 1933 when Vera Ray leaves her three year old son Daniel at home alone so she can work the night shift. While she’s gone, the city is blanketed in a late season snow storm known as blackberry winter and when she returns home, Daniel is gone. In 2010, Claire Aldridge awakens to a similar late season storm. As a Seattle Herald feature writer whose work has been somewhat lackluster of late, Claire’s editor gives her an assignment to do a human interest piece on the storm, and its corollary nearly 80s earlier. It is during research for this article that Claire discovers Vera and Daniel’s story. Their tragedy tugs at Claire’s heartstrings until she becomes immersed in their story, regardless of the consequences. She may not be able to fix her failing marriage, but Claire is determined to find out what happened to Daniel and Vera Ray. 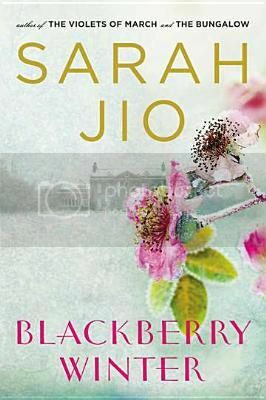 Blackberry Winter is perhaps the loveliest and most moving of Sarah Jio’s books to date. Both the present and past stories are equally important in Blackberry Winter, lending it a sense of balance, so that the reader is always both sad and exciting to transition from one woman’s story to the other’s. It might have been easy to judge Vera Ray for leaving such a small child home alone, but Jio deftly circumvents that response from the beginning by highlighting Vera Ray’s dire straits, without necessarily seeming to do so. Claire too has the potential to be a problematic character, but is quickly turned sympathetic by Jio’s deft characterization. A moving and heartfelt book, Blackberry Winter is difficult to put down as the reader becomes increasingly invested in the lives and fates not only of Vera Ray and Daniel, but of Claire as well. Highly recommended. I’m not sure if this is a book I would like or not, though I’m thinking I would. Either way, I think the cover is gorgeous. I am very intrigued! I tend to like books that focus on past mysteries and couple that with a modern day problem or situation. I will keep a look out for this book! It would be a good place to start! I have yet to read Jio’s books and after reading one great review after another of her books, I am convinced I have to read her works!